When we traveled to Mexico a few weeks ago I was in heaven. Guac heaven. Guacamole is one of those items I can eat morning, noon and night. By the end of the week, the boys were saying NO MORE GUAC! But the girls, Grant and I were happy to slather it all over our morning eggs and breakfast quesadillas on our way out of town and back to the good old USA. I usually just mash the avocado, add some lime juice, salt and garlic. It’s one of my favorite lunches. When I have a few more minutes, I love this dressed up version. It includes so many flavors I love- all in one wonderful bite. 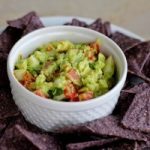 ABK’s Ultimate Chunky Guac is perfect for watching games, family gatherings and all types of parties. Scoop the avocado out of the skin into a medium size bowl and discard the pit. Squeeze the juice of the lime over the avocado. Mash the avocado with a fork into large chunks. Place the chopped red pepper, onion, cilantro, jalapeño and garlic into the bowl. Mix gently. Season to taste with sea salt and fresh ground pepper. Serve immediately, or to keep from browning, spread the mixture evenly in a small bowl using a spatula or the back of a spoon. Press a piece of plastic wrap firmly against the surface of the guac, leaving no room for air to collect. Place in refrigerator until ready to eat. when ready to eat, remove about 15-30 minutes before serving and let sit on counter. Remove plastic wrap , scoop into serving bowl and serve. Isn't Harmons the best?! Great idea. I may have to steal it for next time I'm in a hurry. thanks! you and me both, sista. We need to have him come visit!